This recipe is dedicated to my friend, Larry, whose birthday is today and who is the #1 hater of these meatballs – even though he’s never tried them. Read on and you’ll see why. This recipe is also an apology to anyone reading this who happens to be Italian or of Italian ethnicity – and to Larry, who is also Italian. I’ve heard that no Italian meatball recipe is alike. Every family’s recipe is always better than anyone else’s. I totally get that. I think for Filipinos we feel the same way about adobo and pancit recipes. For the record, my mother’s adobo and pancit are the absolute best. It’s a proven fact. But if we need a judge to find the best Italian family meatball I am more than willing to volunteer. I remember watching this episode of Giada at Home, where she made these meatballs and was cooking with her Aunt Raffi. (It’s always a bonus when Aunt Raffi comes by for a visit.) As I was watching Giada make the meatballs, I loved that she put a piece of mozzarella in the middle for what is, in my opinion, of the best kinds of surprises: cheesy. There was another surprise and she had to do it on the down-low, when Aunt Raffi wasn’t in the room: Giada put ketchup in the meatballs. I thought, “Giada’s Italian – ketchup in meatballs has to be normal. I mean, she’s the living embodiment of Italy on The Food Network so a few tablespoons of Heinz can’t be a bad thing.” Then again, maybe it is if she’s hiding it from Aunt Raffi and lying about it when Aunt Raffi asked if she put ketchup in the meatballs. She straight-up lied to Aunt Raffi’s face. I like being honest and when I made my ketchup confession to my friends I got nothing but hate and I was pelted with ketchup packets in the town center. I could see why Giada lied to Aunt Raffi. 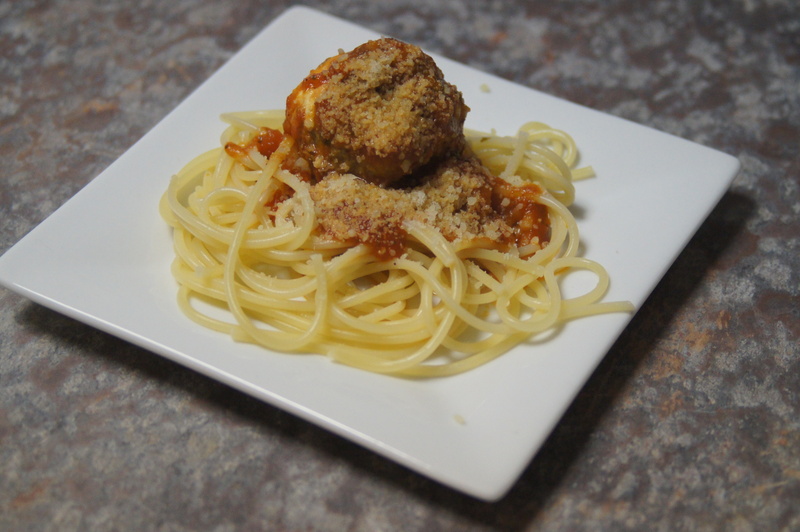 The first time I made these meatballs for my husband, Jon, he absolutely loved them. And he’s Italian (a gorgeous Italian I might add). He might have been a little taken aback when I told him about the ketchup, but I figured he didn’t mind when I saw him enjoying his sixth meatball. If I’m going to trust anyone’s opinion on Italian meatballs, it’s going to be Jon’s. Especially since he grew up having his fair share of meatballs. John Lennon said, “Give peace a chance” and I say, “Give these meatballs a chance.” The seasonings are really good and the amount of parmesan cheese is just right and not overpowering. I also like that the onion is grated so you’re not biting into pieces of onion. And the best part is the mozzarella in the middle. It’s so exciting to cut the meatball in half and see the cheese oozing out into the sauce. Even better is tasting it. Giada uses smoked mozzarella, but I use fresh mozzarella. For me I like the subtlety of the fresh mozzarella. She also adds red pepper flakes, which I used to do, but haven’t in a while. As much as I love spicy food I like to leave it out in these meatballs. Giada’s recipe also calls for half a pound of ground beef and and half a pound of ground veal. It really is good with that mixture, but if you’re not a fan of veal, ground pork works equally well. I’ve never tried it with ground turkey, but I’m sure it would be good. Really, just as long as you have a good bottle of ketchup this recipe will be fantastic. Enjoy and Happy Birthday, Larry! Preheat the oven to 400 degrees F. Line a baking sheet with parchment paper or non-stick aluminum foil. 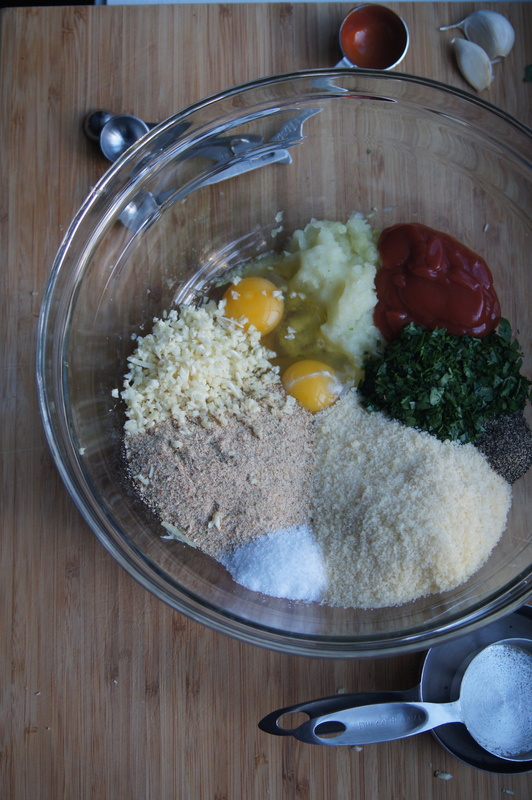 In a large bowl, combine the onion, 1/2 cup parsley, 2/3 cup Parmesan, bread crumbs, egg, ketchup, garlic, red pepper flakes, 1 teaspoon salt, and 1/2 teaspoon pepper. Add the beef and veal or pork. Using your hands, combine all ingredients gently but thoroughly. Shape the meat mixture into 16 (1 1/2-inch-diameter) meatballs and place on the prepared baking sheet. 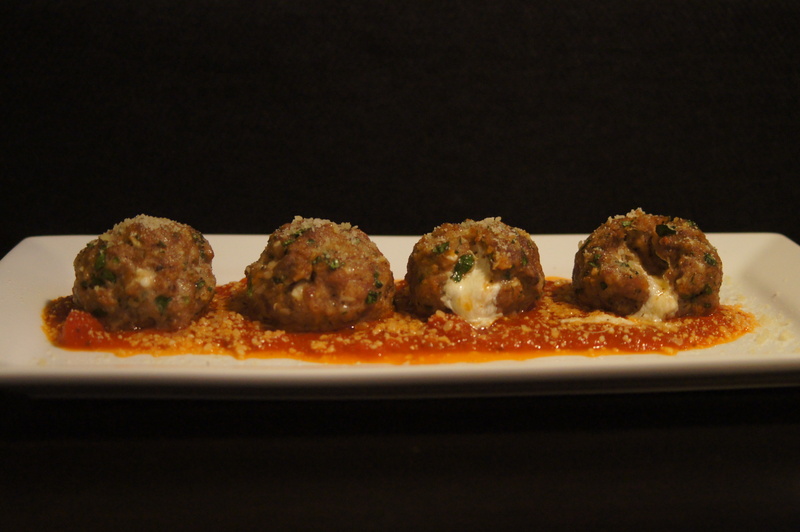 Make a hole in the center of each meatball and place a cube of mozzarella inside. Reform the meatball so that the mozzarella is completely covered with the meat mixture. Bake the meatballs for 15 minutes until cooked through. Ha! Thanks JBIRD! Very funny. They look very tasty. I need to gat past the mental side of the ketchup thing Im sure they taste great. I put ketchup on burgers and meatloaf, so it’s gotta be good in these balls. However, if I’m completely honest here, if I ever make these balls, theres a very good chance I’d omit the red sin. We’ll see how brave I am at time of creation. The cheese looks awesome. Very good! The mozzarella keeps the meatballs moist and I believe the ketchup adds a tang of sweetness with the red pepper flakes. I wish I used veal instead of all beef because I bet it would be even better! I ate 3 1/2 meatballs!